South Barwon City (1974-93) was immediately south of Geelong. Its western boundary was at Belmont (near Geelong), extending coastwards to Torquay. Its eastern boundary was the Barwon River, the river running southwards to the coast where it enters Bass Strait at Barwon Heads. The city’s area was 164 sq km. The name Barwon derives from the river named by in 1835 by John Helder Wedge, surveyor, who expressed it as Kondak Baarwon. The word is thought to be Aboriginal, burwan, meaning great, wide or deep water. The area was first a road district (1857) and became a borough on 21 October 1863, a shire on 24 December 1874, and one hundred years later a city on 6 December 1974. It had urban area at Belmont, Highton and Grovedale and the bayside townships of Barwon Heads and Torquay. Between the urban and bayside areas are agricultural, grazing and dairying districts. Lake Connewarre on the Barwon River includes extensive swamp lands. The borough and shire councils met in a variety of locations until 1885 when shire offices were built in Mount Pleasant Road, Belmont. At that time Belmont and Germantown (renamed Marshalltown) each had about 450 inhabitants, but Belmont was closer to Geelong and on the main Geelong-Colac Road. 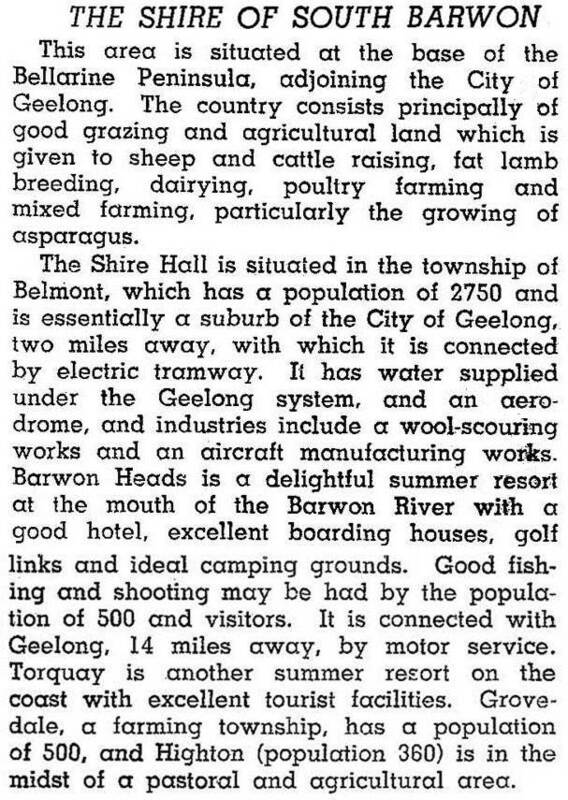 The shire was rural, but with holiday towns at Barwon Heads and Torquay and a developing suburb at Belmont. The council built a new civic centre in 1979. On 18 May 1993, South Barwon city was united with five other municipalities and parts of two shires to form Greater Geelong city.